Most people probably still not have heard of Perfluorooctanoic acid (PFOA) or Perfluorooctane sulfonate (PFOS), but for many people living near U.S. military bases, these chemicals have become very well known. Over the past few years, PFOS and PFOA have been generating headlines across the country, with drinking water contamination from firefighting foams reported on and around at least 37 military bases in 19 states. In the Philadelphia region, the highest profile contaminated military sites include the former Willow Grove Naval Air Base and current Horsham Air Guard Station, and the former Naval Air Development Center in Warminster, Bucks County, as well as New Jersey’s Joint Base McGuire-Dix-Lakehurst, and the Delaware Air National Guard Base in New Castle, Delaware. PFOS and PFOA, the two most notable of the Perfluorinated compound (PFC) family, have been found in the blood of humans, wildlife, and fish. Adverse health risks associated with exposure to PFCs include developmental issues and select types of cancer (i.e. kidney cancer). These chemicals were widely used in firefighting foams from 1970 to 2015, to extinguish fires from aviation fuels at military sites and airports. On May 25, 2016, the United States Environmental Protection Agency (EPA) issued a public health advisory, and established health advisory levels of 70 parts per trillion (ppt) for PFOA and PFOS in drinking water. This interim standard is very low, and is especially impactful, considering that the compounds were previously unregulated in drinking water supplies. More recently, the States of Delaware and New Jersey have issued even stricter regulatory standards of 7 (PFOA and PFOS) and 14 (PFOA) ppt, respectively. After the EPA classified these compounds as “emerging contaminants,” the Department of Defense required testing of water quality at nearly 400 facilities where the firefighting foam was used. The results have been staggering for some of these communities, as public water supplies have been shut down, due to significant exceedances of the EPA health advisory standards. More studies are yet to come, as Congress’ recently approved Omnibus spending bill allocated $44 million to the Air Force and $44 million to the Navy, to conduct additional studies and remediation, specifically on sites with suspected and/or confirmed PFOA and PFOS contamination. 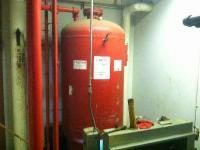 As more studies are conducted, PFCs are being found in water supplies near other types of non-government facilities, including certain types of manufacturing plants, fire safety training centers, airports, and other undetermined sources. 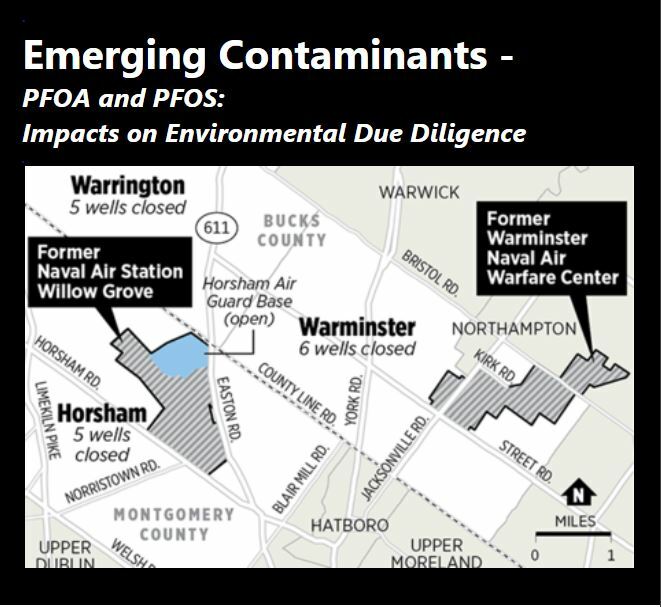 Locally, PFOA and PFOS have impacted drinking water supplies in two additional Bucks County neighborhoods, at the Ridge Run PFC Site in East Rockhill, and the Easton Road PFC Site in Doylestown. These Sites are actively being investigated by the Pennsylvania Department of Environmental Protection. How Do PFCs Travel in the Environment? The chemical characteristics of these compounds make them highly soluble in groundwater and persistent in the environment, as they do not hydrolyze, photolyze, or biodegrade. As a result, PFCs can migrate long distances through groundwater, and have been documented in contaminant plumes extending over one mile from the source area. 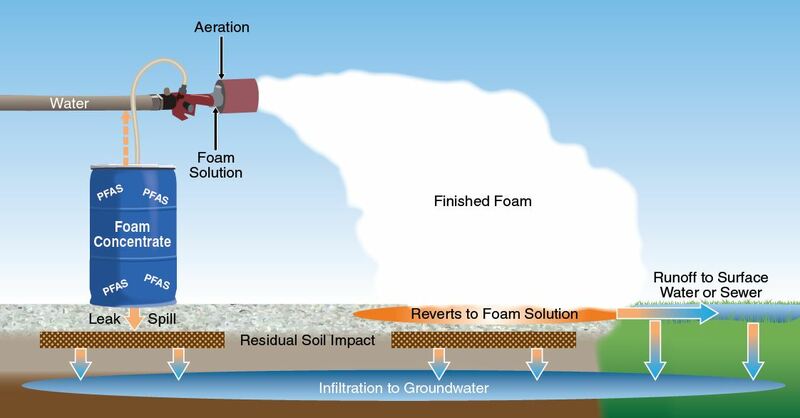 Environmental release mechanisms have been documented to include direct discharge to the ground from extinguishing fires or in fire safety training areas, discharge of waste water to soils or drainage lines, land application of contaminated sludges, and dispersion from industrial air or vapor emissions. Once discharged to the surface soils, the soluble compounds migrate down to the groundwater with infiltrating precipitation, and disperse from there. How Do They Impact Environmental Due Diligence? PFOA and PFOS present special challenges for the Environmental Professional when conducting Phase I and Phase II Environmental Ste Assessments (ESAs). It is essential to stay up-to-date with both Federal and State regulations and advisories, which are continuously being updated for these compounds, as more is understood. Interim standards and advisory levels vary from state to state, and are often not included in a state’s published list of cleanup standards. Consider a typical Phase I ESA for a commercial or industrial property transaction. As part of All Appropriate Inquiry, as defined by the EPA, the Environmental Professional typically follows specific protocols outlined in ASTM’s Standard Practice for Phase I Environmental Site Assessments, to evaluate whether potential environmental liabilities are present. Standard practice includes inquiry of reasonably available public records sources, to gather readily available information for the subject property and surrounding area. This records search and review is typically accomplished through the acquisition and review of a Regulatory Database Report, which is available through specialized database providers; But due to the lack of published health standards and the short period of time since the publication of the EPA health advisory, there can be a lag time before even the known PFC sites make it onto these databases. As a result, it is essential that the Environmental Professional keeps up-to-date with both the regulatory and technical landscape, as both are continuously evolving. They will need to rely on their specialized knowledge and experience to know when to dig deeper, and what questions to ask, to determine whether a property may have a greater potential for PFOA or PFOS liabilities. In a Phase I ESA, this carries through the interview process, the site reconnaissance, and the historical research of the property and neighboring properties. For a manufacturing site, the Environmental Professional needs to consider whether PFCs were ever part of the onsite manufacturing process. For commercial sites, we need to consider all potential offsite sources, current or historic, and evaluate the potential for the PFCs to have migrated onto the property from those offsite sources; And, of course, if fire-fighting foams were used onsite or on nearby properties. The next set of challenges comes when there is a recommendation to collect groundwater or soil samples for PFOA and PFOS analyses. Specialized sampling equipment and techniques are required to prevent “false positive” detections, due to cross-contamination from sampling equipment, bottleware, lab equipment, or any number of other sources. Thus, in addition to a top-notch laboratory, an experienced Hydrogeologist and a solid QA/QC team are crucial for assuring accurate analytical results. If you would like to know more about PFCs and other emerging contaminants, please contact one of our experienced Hydrogeologists at Brickhouse Environmental. We will be glad to assist you in any way that we can.